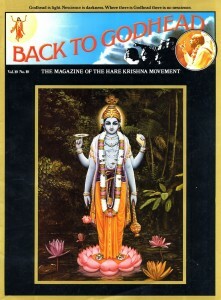 Back to Godhead > ISKCON > Letters > Letters: Reincarnation, Why can’t I remember my past lives? Letters: Reincarnation, Why can’t I remember my past lives? The editors of BACK TO GODHEAD welcome correspondence pertaining to spiritual enlightenment. All letters will receive personal replies, and correspondence of general interest will be published regularly. The Bhagavad-gita speaks of reincarnation. Why can’t we remember our past lives? We forget our past lives in the same way that a person with amnesia forgets his past. Just as amnesia is caused by a traumatic psychological experience or physical injury, the severe trauma of death and rebirth erases the memory of our previous life. But what is the ultimate importance of my knowing that in my past life I had the body of an American or a Russian, a cow or a dog? The crucial thing is to remember who the eternal “I” is who undergoes all these changes of bodies. The Vedic scriptures, especially Bhagavad-gita As It Is, can reveal to us who we really are behind the facade of bodily identification. By hearing Lord Krishna’s instructions in the Bhagavad-gita As It Is and acting on them, we gradually awaken to our real identity as a pure spiritual being, an eternal loving servant of the Supreme Spirit, God. With this understanding all our curiosity about past, present or future lives will be satisfied. I am confused by the great variety of spiritual reading matter available today. Each author claims that his is “The Way.” But I need more than just a book. I need someone I can trust to guide me on the spiritual path. How can I make such a decision? Your confusion is well justified. Anyone interested in spiritual life today is confronted by such an array of gurus, yogis, priests, sages and self-made gods—each claiming his teachings alone to be the “Truth”—that reasoned choice seems impossible. Here are a few time-tested guidelines by which any honest seeker can judge a prospective spiritual master and the path he advocates. First we must understand the meaning of the word “spiritual.” It indicates something in relation to the Supreme Spirit, God. The goal of a spiritual discipline should be realization of God and our relationship with Him. This eliminates the great majority of groups on the market today—from yoga and meditation societies to the so-called human potential movements—because their aim is only improvement of the body or mind. They give no information on how we can discover our spiritual identity. The Gita goes on to state the necessary qualifications of a genuine guru: First and foremost, he must be part of a disciplic chain of spiritual masters beginning with the speaker of Bhagavad-gita, Lord Krishna (God) Himself. Furthermore, he must be humble, self-controlled, peaceful, completely uninterested in personal gain, and always glorifying God with his words and deeds. Finally, the Gita tells us that “such a great soul is very rare.” (Bg. 7.19) Few people make the grade. But, we do know that His Divine Grace A.C. Bhaktivedanta Swami Prabhupada, the spiritual master of ISKCON, lives up to the expectations of the Bhagavad-gita. You can find this out for yourself by reading his books. If you choose to become his disciple, you will have made a good decision. He is a person you can trust to guide you safely on the spiritual path.